If you are wondering why the BUYSTORIES blog was inactive for a bit, we were busy rolling out this gorgeous Shopper Marketing Campaign for ITC Foods. Bingo! Launched a new format of chips ‘Original Style’. As the name suggests unridged potato chips format is the original favourite of India esp. down south where it is consumer with meals and at tea time. BUYSTRIES creates an Uncompromising PURE Shopper Marketing campaign that includes 15 elements across the shopper journey within the store with a distinct store zone & shopper behaviour based message for each element. The campaign received a cover page story in India’s only Shopper Marketing Magazine Point-of-Purchase. Please read on for a details on strategy, shopper insights, pictures and client feedback. This Bingo! Yumitos campaign by BUYSTORIES goes to prove how an effective shopper right campaign can be created using the available creative elements and without any compromise to the brand’s identity. 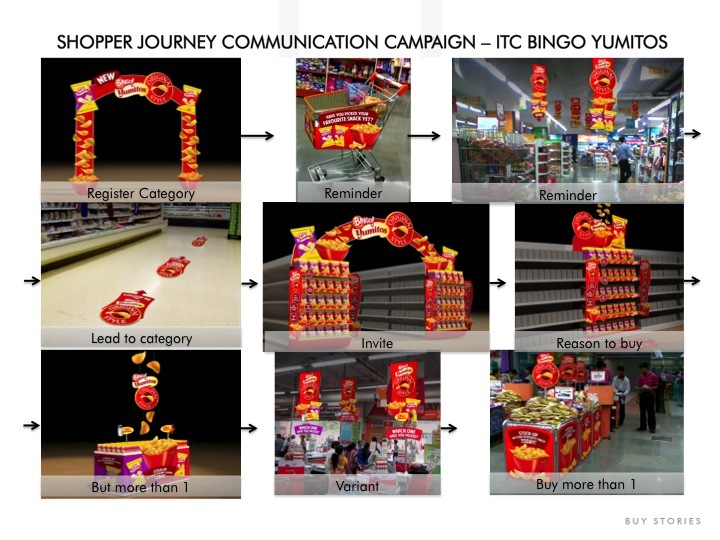 This entry was posted on July 24, 2014 by thebuystories in our work and tagged Aaradhee Mehta, Bingo, Buystories, BUYSTORIES work, BUYSTORY, customer experience management, gorgeous Shopper Marketing Campaign, ITC Foods, potato chips, Shopper Communication, Shopper Journey, Shopper Marketing, Shopper Marketing 2014, Shopper Marketing at its BEST, Shopper Marketing campaign, shopping experience.